Whether Arnold is an Amstaff or an APBT, he is one handsome dude! I think you would be justified in referring to him either way. Some owners who have pedigreed dogs that look like Arnold have actually gone so far as to have them registered both ways--as an Amstaff with the American Kennel Club and as a pit bull with the United Kennel Club. 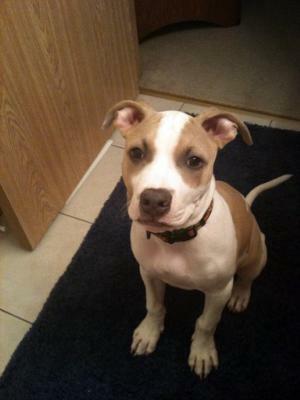 What Exactly is a Pitbull?, Types of Pit Bulls and How to Tell an Amstaff from a Pit Bull. Hope this helps. Enjoy your beautiful dog! Comments for AMSTAFF or APBT? ?